52 Weeks #38: Two Games finished. So this week I was able to put some finishing touches on two of the items I will be offering up at the craft fair. My tic-tac-toe games, and some sets of Bewitching Cubes. 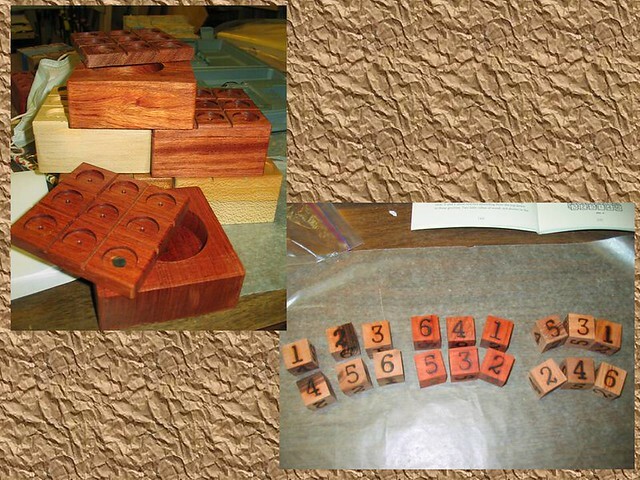 For those not familiar with the Bewitching Cubes; I found the them in E.M. Wyatt’s “Puzzles In Wood”, the object is to orient each of the cubes so that each face shows the numbers 1-6.These three sets are made out of various woods which I forget right now and burned using Walnut Hollow Number Stamps. I made my father set a few months ago and he is still working on them, so I thought they may be a fun thing to try to sell. Made up a direction/solution sheet to go with them. If anyone is interested in making then let me know as I came up with a few tricks that seemed to work well for numbering multiple sets. The tic-tac-toe boards am going to let folks choose then types of stones they want to go with them. I have about 6 different colors. Did a little scrap test with that soy based stain I bought and I am going to apply it this week to my Ox-Yoke Puzzles and get those finished. I have about 4 more weeks and have to come up with I think 1 or 2 more puzzles and also some pens in that time. Then after that I need to make like 2 dozen pens. Busy times are coming just have to get motivated in the evenings after work.